Avocado skins make for perfect portions. It is 11:08 p.m. and I am finally at my computer, ready to blog about my experience of making a double-batch of guacamole. 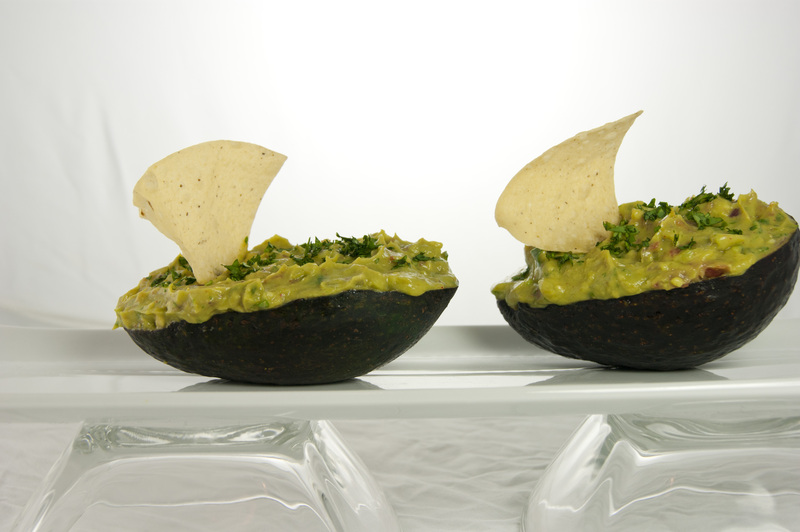 I aimed to perfectly craft guacamole in taste and appearance, to the best of my abilities. My abilities took four hours. I researched which guacamole I wanted to test out, and I decided on Alton Brown’s (no relation that I know of) recipe on foodnetwork.com. It’s Alton Brown, so the recipe’s perfect to near-perfect already, right? Scientifically and culturally proven to be perfect, usually! Or that’s how I perceive it on his TV show. Anyways, I had a whole spread planned out in my head of what I wanted to make for dinner and I went to the store to buy all the ingredients. I completed one “dish,” and it wasn’t even my proposed entrée. 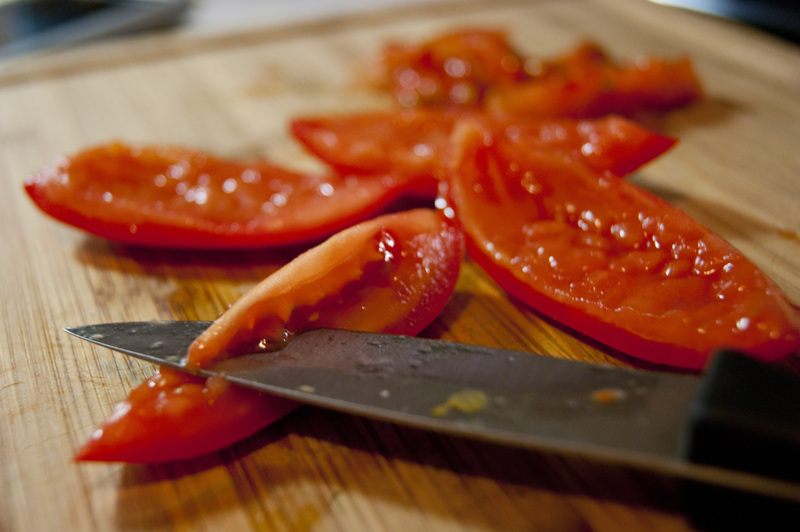 If Alton Brown says to seed a Roma tomato, you do it. 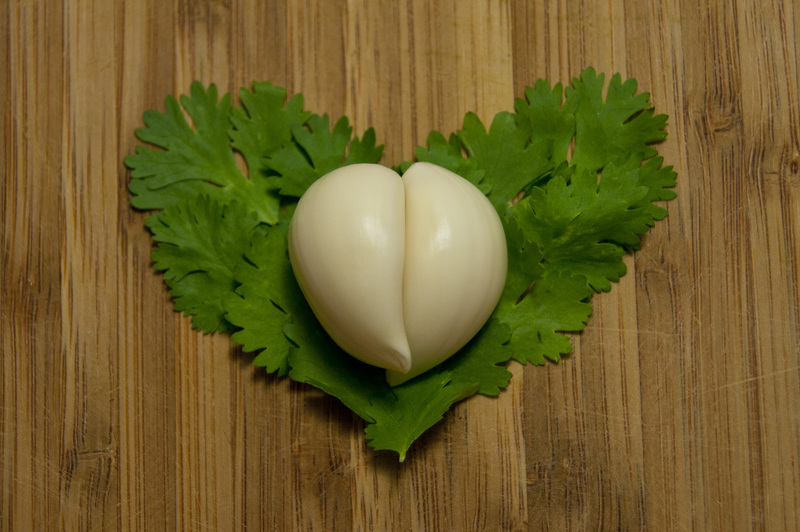 My love for cilantro and garlic portrayed simply. This took time and distracted me, too. Creative Design by Haley Brown. I grew up not liking guacamole, avocados or onions, but somehow over the years I developed a better taste for guacamole. Still working on the onions but I really can’t stand them (unless they’re “masked” which is hard to do, but definitely not plain onions). I think my appreciation for good guacamole happened during my Spring Break vacation in 2009. My mom, sister and I went to California to visit my aunt and we traveled along the coast from Oakland to Santa Barbara. It was at Post Ranch Inn where we took an evening to relax after hanging out on Pfeiffer Beach. 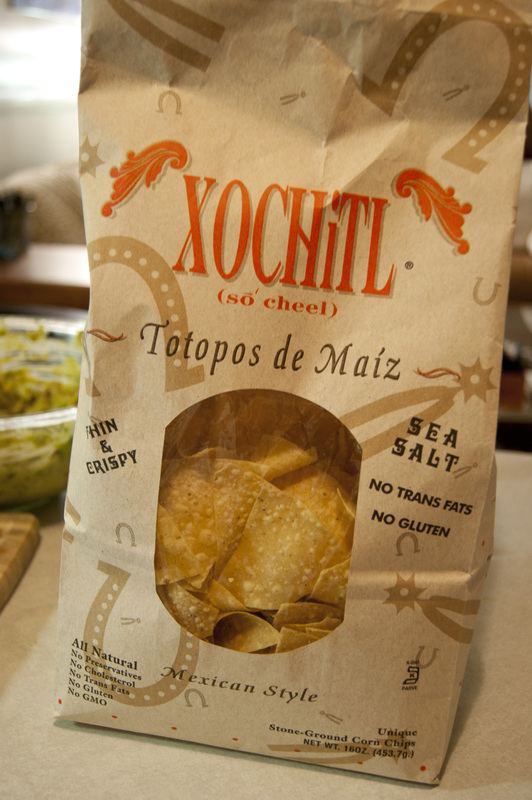 We sat on the deck of Sierra Mar, Post Ranch Inn’s restaurant, atop the cliffs and looked down and across the Pacific Ocean during the sunset all while enjoying tortilla chips and a trio of salsa, black beans and guacamole. It was one of the most tranquil spots I’ve been in. The dinner we ate much later was probably the most exquisite meal ever, but I can’t even attempt to recreate that moment and that meal, and I am still overwhelmed by it and grateful for indulging in it thanks to my mom and aunt. Later that week we headed to Santa Barbara. For lunch one day, we ate at Sandbar Mexican Restaurant and Tequila Bar and again ordered guacamole to go with our chips and salsa. I don’t eat guacamole a lot, or hardly ever, but I think I got a major craving recently because not only did I miss that whole trip and those memories, but let’s face it, a hint at a vacation every so often is nice if it has been awhile and you’re not preparing for one for the future. Four hours of peeling, scooping, chopping, dicing, filleting, mixing, mashing and preparing guacamole and photographing it in between and after. Unfortunately I don’t have any cool gadgets to help out the process, such as the ones my grandpa used to collect, but I may need to invest. It took my Chicago Cutlery Santoku knife to halve the avocados, my C.C. paring knife to extract the fruit from its skin and a spoon to scoop it out. I managed to keep the skins intact to create serving boats for the guacamole and I added a finishing touch of minced cilantro on top. When I cook, I try being thoughtful, methodical and cautious. Baking is a slightly different story consisting of not-exact measurements and it usually doesn’t turn out as well as my cooking results do. At least guacamole is filling. (Avocado superfood!) My double-batch bowl of guac topped with lime juice, plastic wrap and a lid will hopefully hold over for a while in the fridge. Tomorrow’s a new day and a new dish, and I’m thinking burritos.